We're blessed to live in a fairly new house in an old neighborhood in beautiful Durham, North Carolina. Isn't that Autumn sky something? Now step right up the front door. We love the traditional colors of Autumn here. Maybe that's because we're a family of redheads. We could just sit here on the porch for awhile if you like. This is one of my favorite spots in the whole house. It really is our outdoor living room. You can read all about it here. Or you could come on in! I've cleaned and scrubbed and polished in anticipation of your arrival. 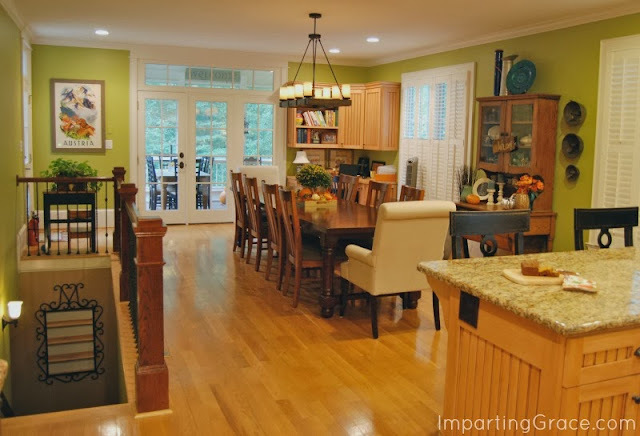 When I'm looking at home tours online, I always wish I could get a sense of how the rooms flow. In case you're wondering how our rooms are connected, here's our main level floor plan. Sorry that it's so smudged, but it'll give you an idea of our space. Now let's peek into the rooms, shall we? To the left of the front door is my husband's library. It doesn't take much to make this room feel fallish. A mum and a jug by the fireplace echo the autumnal colors in the rest of the room. 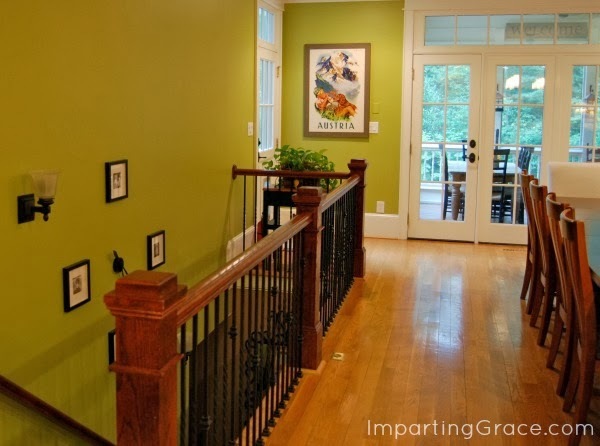 Now back across the foyer to the and the dining room. I had a red dining room for 20 years, but I sure have been happy with it painted blue. 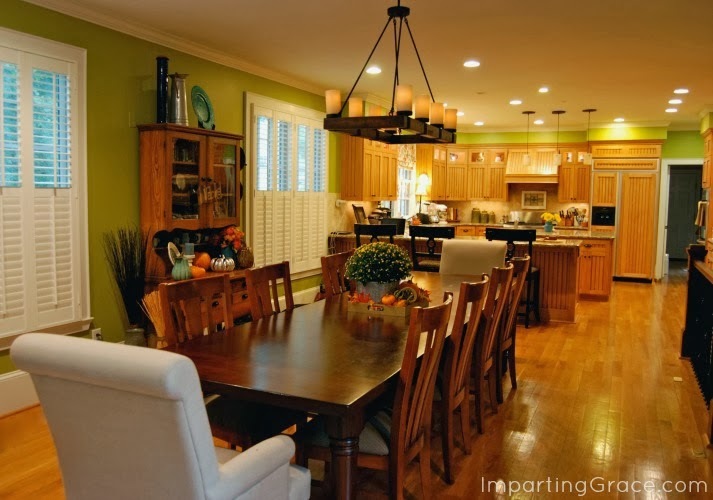 I like bold colors in a dining room. Here's a view looking back toward the foyer. 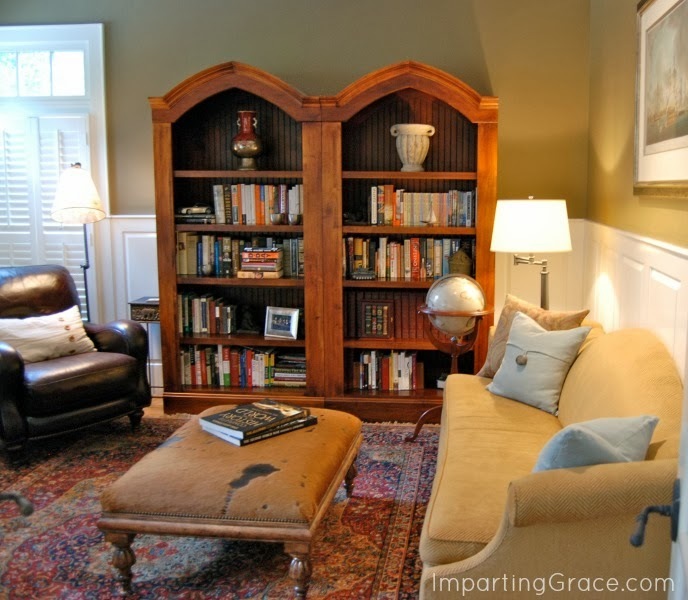 The arches and built-in china cabinets are some of my favorite features of our house. 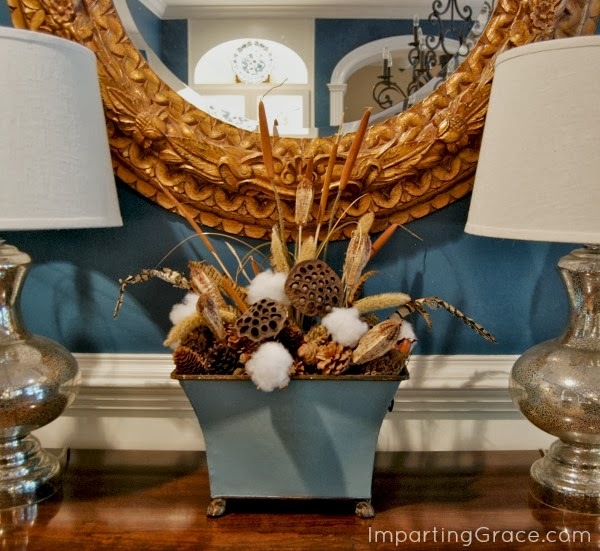 Simple and elegant was my approach for decorating the dining room for fall. For the tablescape, I combined mercury glass pumpkins and candlesticks with DIY birch candles and placed them all on a DIY burlap runner. I crafted an arrangement for the buffet from natural elements; I'll share more about it next week. Well, technically this is not a buffet; it's actually just the bottom of my china cabinet. I removed the hutch this year and I've loved having the open space on this wall. Another of my favorite features of this house are the lighted nooks above the cupboards. They're filled with my collection of pitchers. Above the kitchen sink is my DIY no-sew faux Roman shade. As you can see, this is a working kitchen. We're definitely a small-appliance-out-where-they're-easy-to-use kind of family. 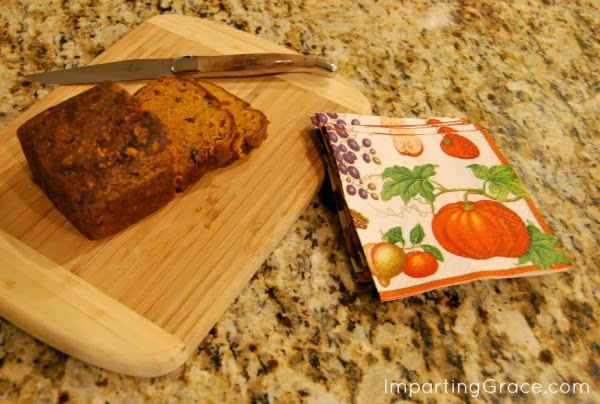 Now, wouldn't you like some pumpkin bread? I just baked some. Click here for my recipe--I think it's the world's best! Believe me, the kitchen is not usually this clean. Home tours always make me want to see what people keep in their cupboards and closets, you know? If you were to open this one of mine, you'd discover one of my quirks: I have a special love of beverage napkins. My friends laugh at me and my stash of pretty napkins. Now moving to the other end of this big room. To the left are the stairs leading to the lower level; to the right stands my mother's prized dough cabinet alongside our huge table. A lot of teenaged boys can fit around this table! The dough cabinet is one of my favorite pieces to decorate for the seasons. I'm crushing on the combination of aqua and orange this season. On the large wall leading down the stairs is my DIY family portrait wall clock. You can read about it here. 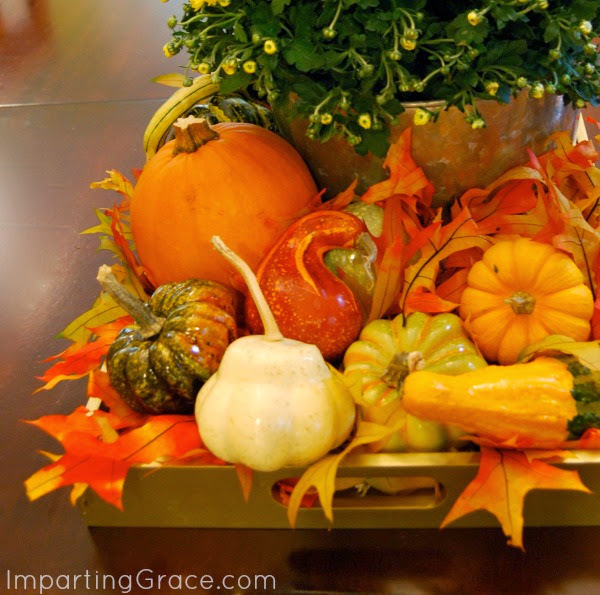 I made a centerpiece for the table by placing seasonal elements on a tray. That way I can whisk the centerpiece aside easily when we need the use of the whole table. Through the French doors is our screened porch, which will be the last stop on the tour. Our house is built on a hill, so the screened porch is high off the ground. I feels like being in a treehouse! 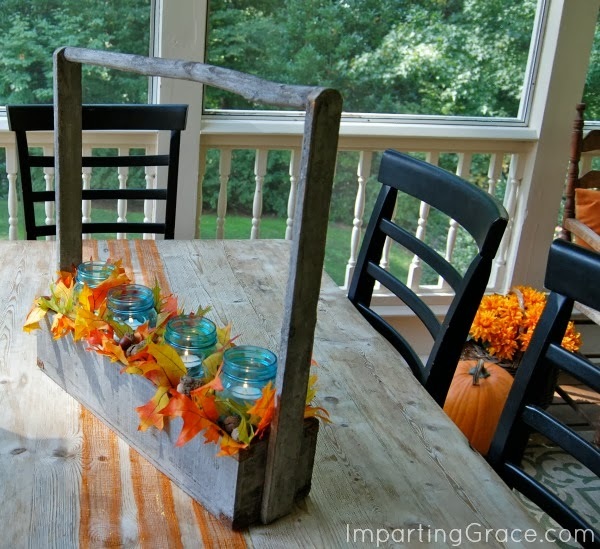 I created a simple tablescape by stapling some ribbon to the table to make a runner, then adding a tool caddy filled with autumn leaves and some beautiful blue Ball jars. Some mums and pumpkins complete the fall decor out here. Told you I was loving aqua and orange! Thank you so much for visiting me here at Imparting Grace! I'd love for you to poke around while you're here. My prayer is that you'll be blessed by your visit. Enter to win this gorgeous hand painted Sarasota Chest in Crème Brûlée from Somerset Bay, a prize valued at $1,500. The contest is open to U.S. residents only. I'm having trouble with the Rafflecopter widget, but you can enter easily by visiting Marty's Home Tour and scrolling to the end to the Rafflecopter form. Just follow the directions to enter the giveaway. Click here to have Imparting Grace delivered to your inbox. Your home is gorgeous Richella! From the front porch to the back porch...perfect! Beautiful fall touches! Wonderful tour Richella! 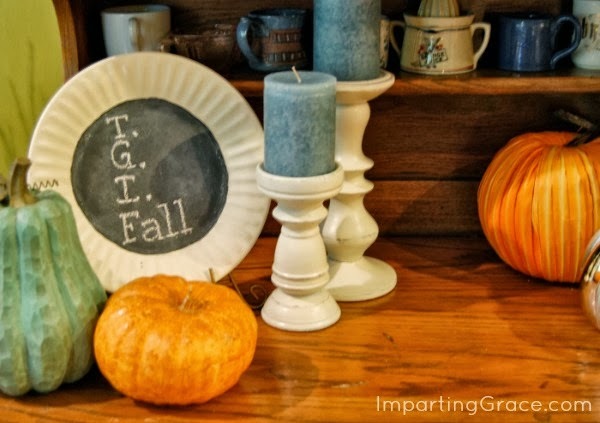 Love all your fall touches especially the TGIFall plate - so cute! So many things I love about this tour, I'm not sure where to begin! Your style is so classy and welcoming. 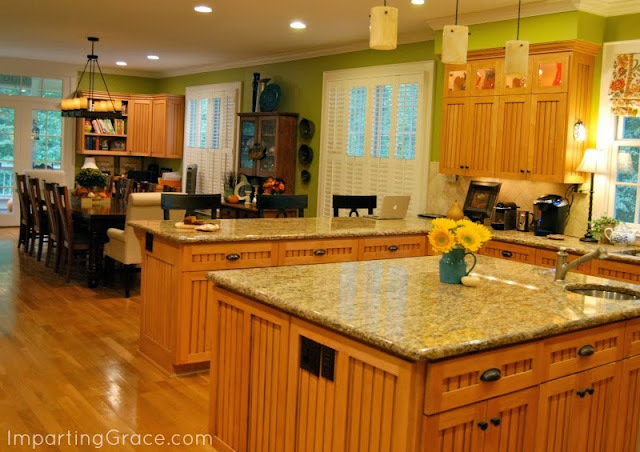 I really love your bold choice in wall colors, that you leave your small appliances out ( I do that too! 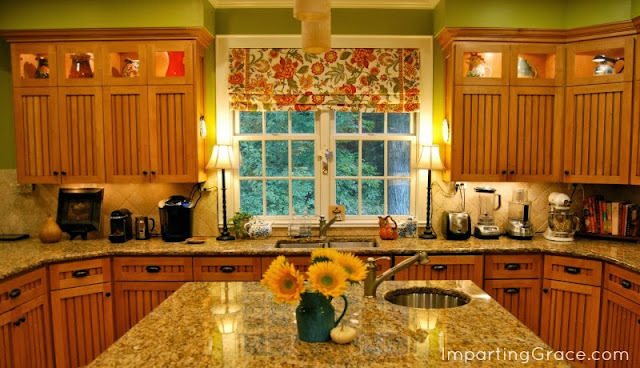 ), that you use your Mothers dough cabinet (that is so sweet and special), and especially how you show that you can use just a few items and create that Fall cozy feel with elegance and without going over the top! I always enjoy my visits to your page, you definitely have an eye for decorating =) Hope you have a wonderful weekend! 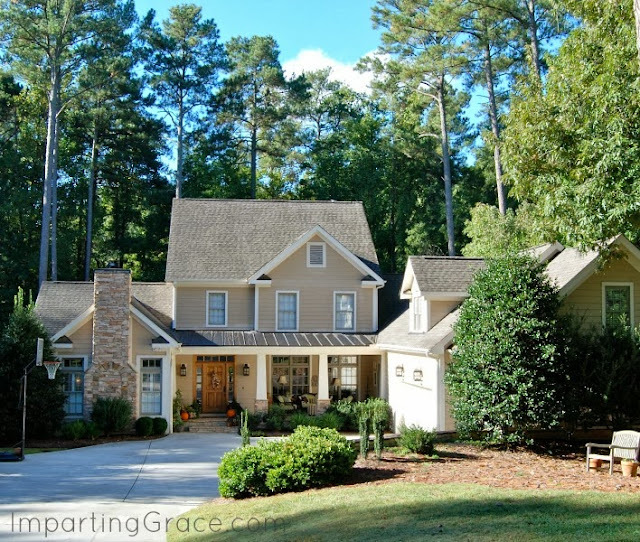 A fabulous Fall home, Richella, filled with beautiful splashes of the season! I love the architectural details in your home, too! 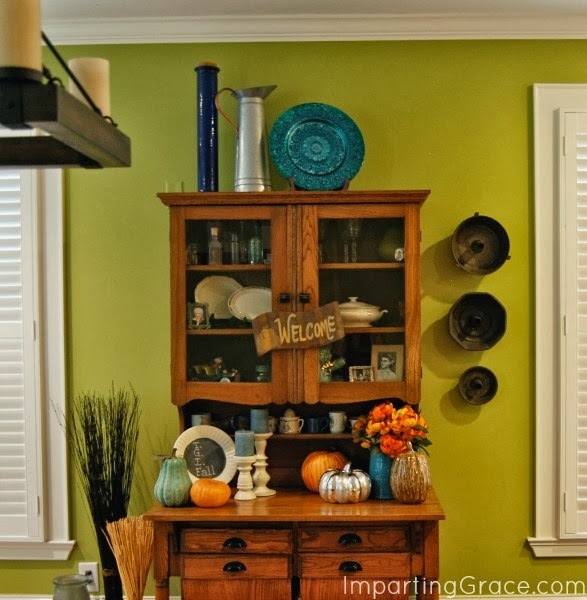 Your mercury pumpkins in the dining room pop wonderfully against your gorgeous wall color! Happy Fall! Your tour is wonderful! I would love to have your "treehouse" screened porch. That looks perfect for this time of year. I enjoyed seeing all your fall touches! Oh Richella - you did a fabulous job! Love all of your fall touches everywhere. 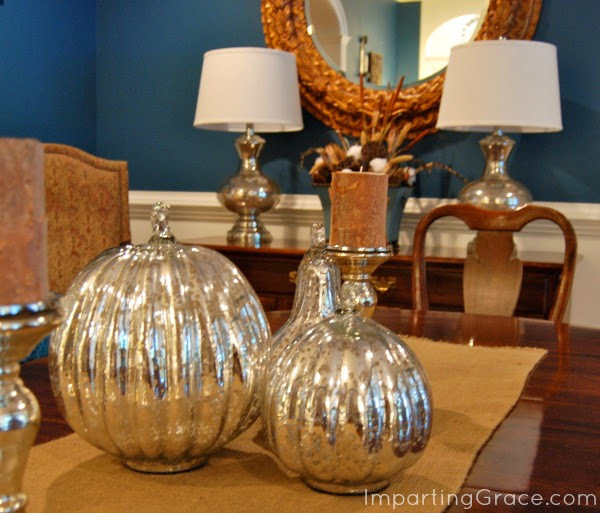 The mercury glass pumpkins look so pretty in your beautiful blue dining room. I love how you decorated the dough cabinet too. Oh - and I'm glad to learn that I'm not the only one who loves collecting beverage napkins! My husband and I just looked at your home tour. He loved your home's floor plan and the way you decorated. 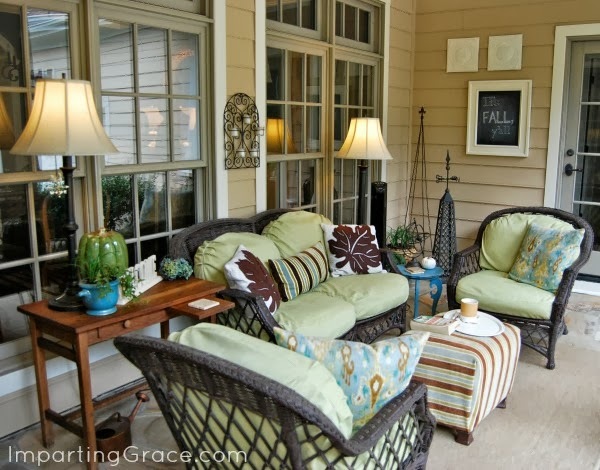 I love your whole house, but as always, I'm crazy for that screened porch! I just love it. Your home is beautiful and you've made it so welcoming. 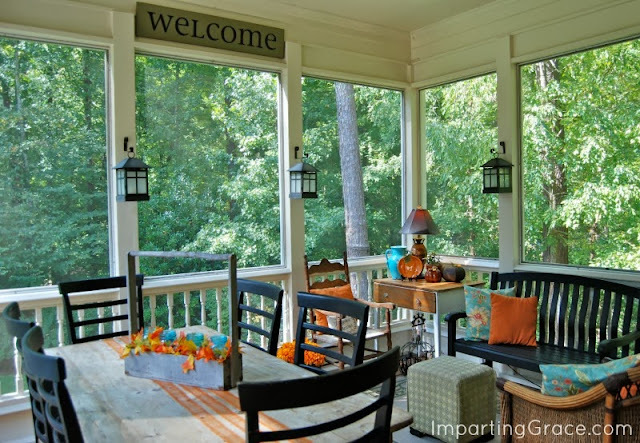 Can I come live in your screened porch? I think I could sit out there every day, all day long! You have the perfect home for entertaining. Lots of open space and it all just flows together. Beautiful. Sharing this on Facebook today! Love all your fall touches. Richella, You have the most welcoming, beautiful home! Just says,"Come in and sit awhile" to me! Love all your subtle decorations! Love your big kitchen table! Glad to see your "napkin drawer" is full!! Thanks for the tour! Blessings to you and your family! It is beautiful, Richella! Every room beckons me to some and savor. Your warm, inviting home truly reflects the beauty of its owner. Your home is a favorite of mine! Always nice to see what touches you have added for the season. 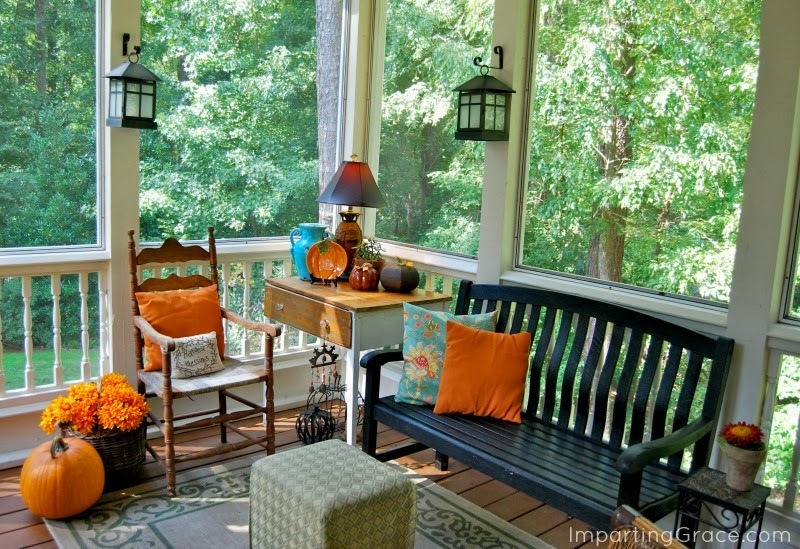 I could take up residence on that screened porch, love it! I especially appreciate your sweet spirit, Richella. Always so warm and welcoming. 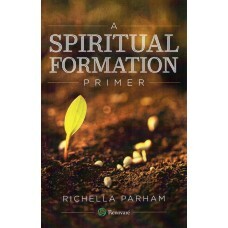 Richella, Where do I begin? You home is magnificent! So beautifully decorated. 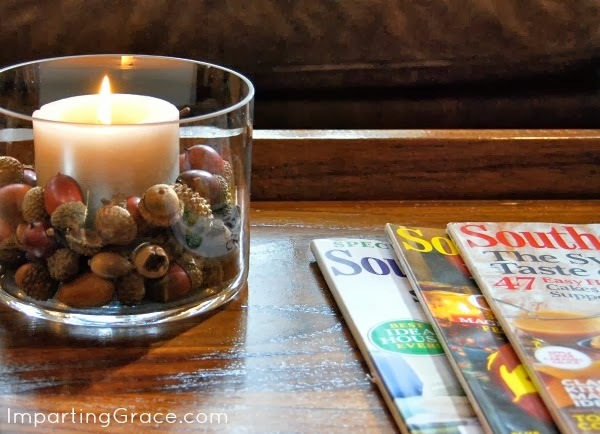 I love all the touches of fall you have around your home. My favorite piece is your dough cabinet too. How clever of you to hang vintage bundt cake pans on the wall! I love love love the screened in porch. It does look like you are high up in the trees like a treehouse. Wonderful tour! So happy I stopped by! Your home tour is lovely! Thanks for sharing with us! Richella, this was such a lovely tour! 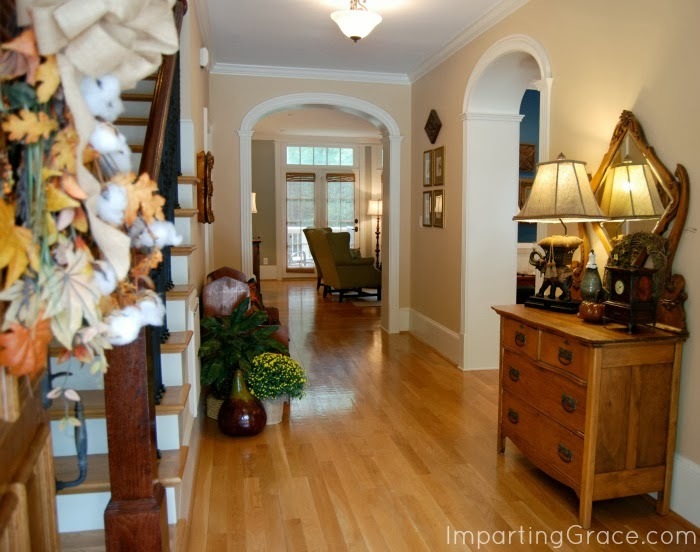 Your home is just beautiful, from the front porch all the way to the screened porch! I love that you embrace such bold colors; and it makes everything feel so warm and inviting. You have such a talent for making a house a home! Your home is gorgeous. Absolutely love the fallness. Love it all. 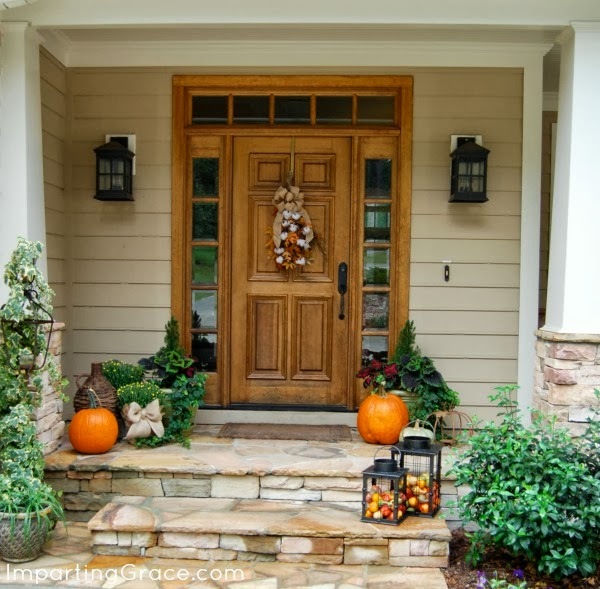 Your whole home is just gorgeous, thank you for opening it up to us and sharing it for fall! I really love the floor plan of your home. The problem with ours is all the bedrooms are upstairs which could become a problem as we age. 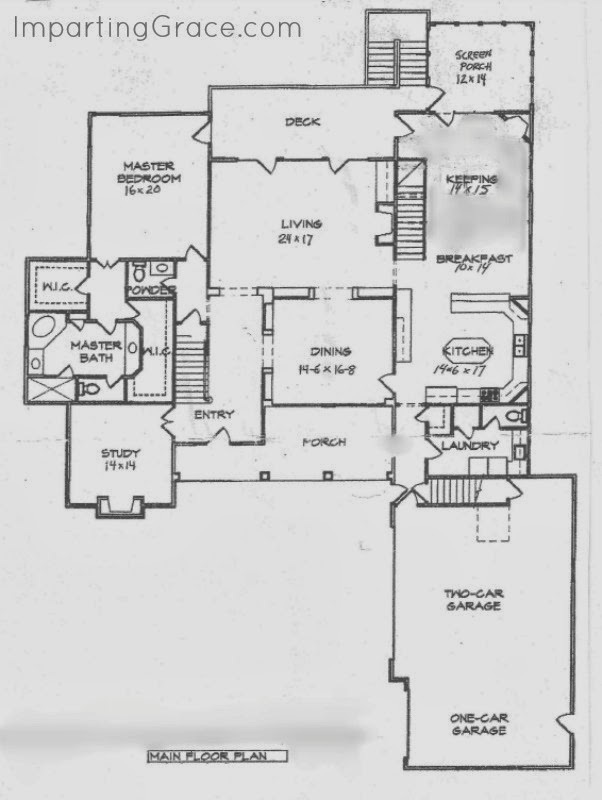 Do you show the floor plan of the upstairs or basement? Thanks for sharing your lovely space. Your home is just stunning. 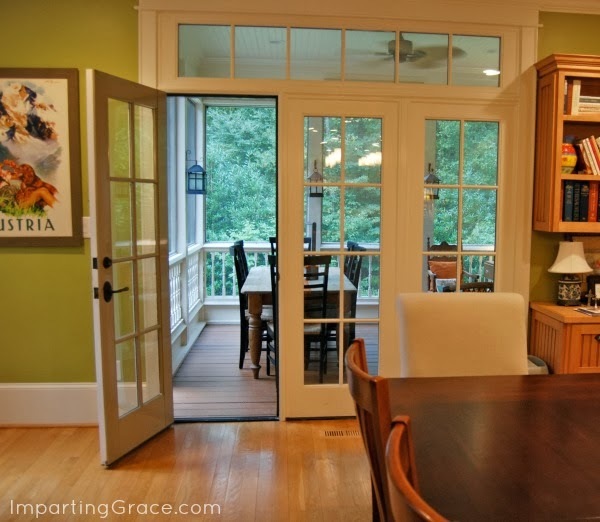 Love the front porch and your kitchen is always amazing to me. Your touches for fall are perfect. 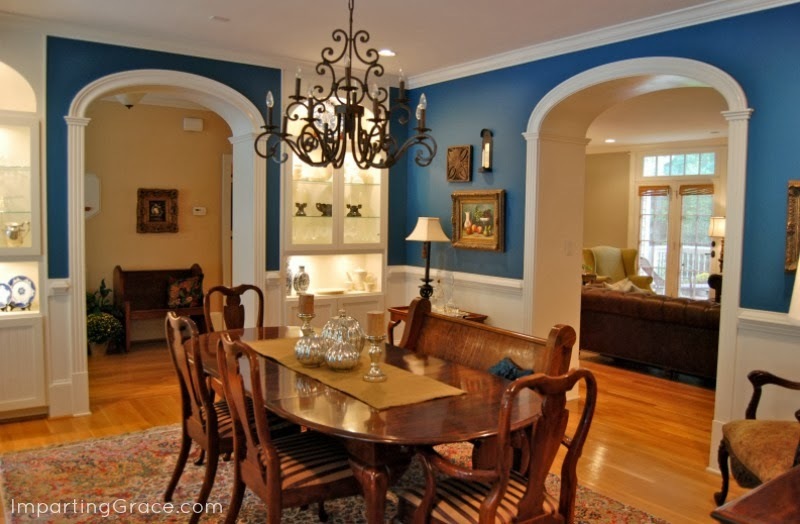 The dining room is so pretty, love the color and the chandelier!! Have a great weekend!! It's just stunning, Richella! Beautiful home, beautifully decorated and I can tell it stays full of friends and family, which is what home really is about. 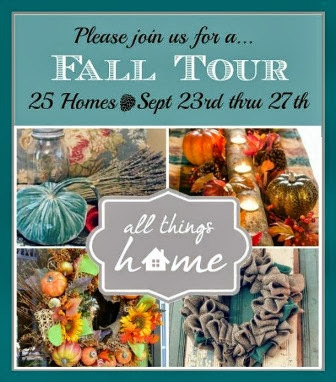 I'm so glad you joined us for the fall tour and I love getting to know you better through your home! Hahahaha, I'm impressed!!! Someone else who has a LOVE for Beverage Napkins as much as I do!! I have 2 special drawers for them in my buffet and bar and also a huge stack of them in my pantry!! I love them!! 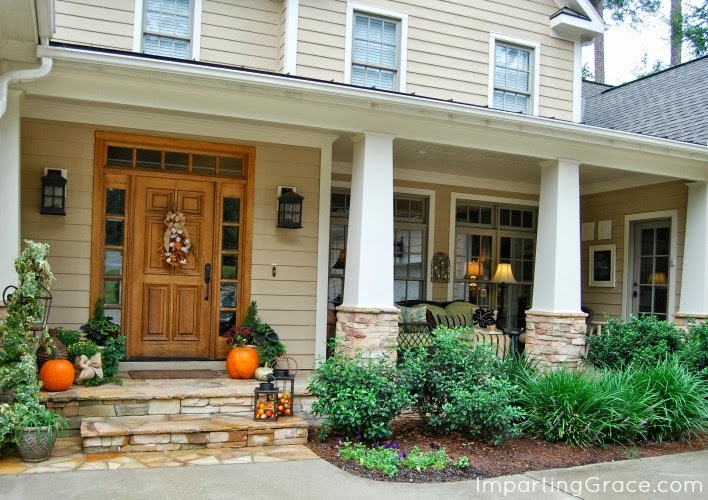 Now, about your beautiful home...I LOVE it and your porches are fabulous!! 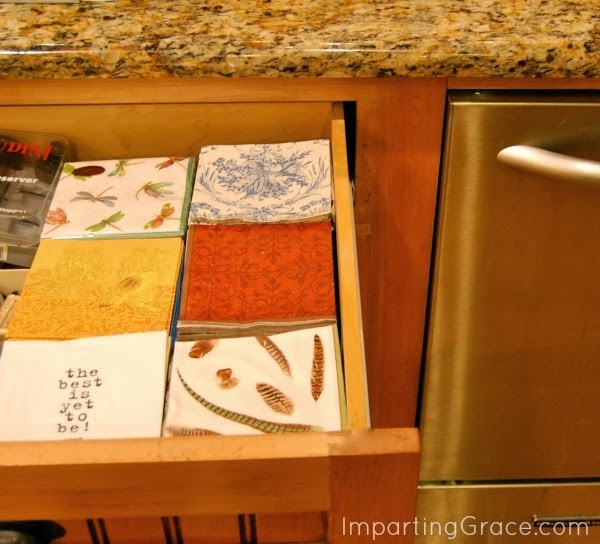 Thank you for sharing and I'm going to pin your napkin drawer so I can drool over it online! Friday blessings Richella, Girl I just have to tell you how much I love your house!!!! Each detail your added is perfect. I especially love your ktichen, your screened room-well, every room is perfect. Seriously, can I come live at your house-lol. Hope you have a wonderful weekend dear one and thank you for sharing. Your home looks so lovely! I agree with everyone on coveting your screened in porch! Beautiful job! Wow! I'm so glad to know someone hoards beverage napkins other than me! ;o) Your home is gorgeous as always! Love the orange & aqua combo. Pier 1 has some pretty fall-ish pillows using that color combo that I've been tempted to buy, but I'd prefer they go on sale. ;0) Happy Fall! You have a very lovely home! Such a pretty tour!! Thank you for sharing it! I really love your house. I am only an hour from Durham . Thanks for some great ideas. Your home is beautiful, Richella! I enjoyed the tour so much! Almost like being there. I sure would love to come sit on your porch and chat :-). Beautiful as always....so warm and cozy. Yours was one of the first blogs I started reading....even before I really knew what a blog was :) If I yell really, really loud, maybe you can hear me 30 miles down the highway...lol! HELLO RICHELLA! Did you hear it?? Have a wonderful weekend. Absolutely gorgeous!! 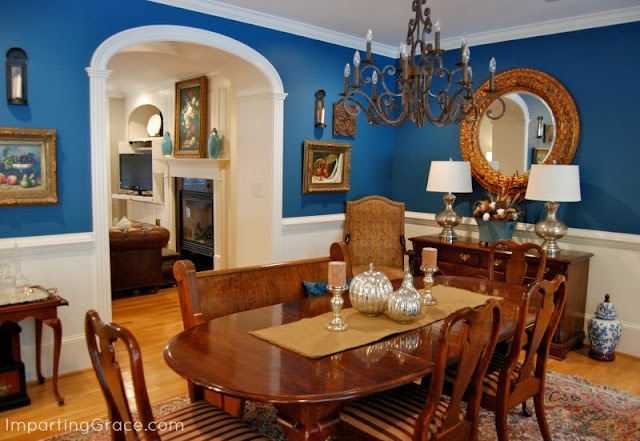 Love your use of color ~ the dining room is great with the blue. Your home is very warm and welcoming and I especially love the screened in porch. I would probably spend hours out there. Thanks so much for sharing your precious space with us! Beautiful!!!!! I just love your home, as always. You have a lovely home, Richella. May you always be richly blessed in it. It is always such a pleasure and a true blessing to be invited into your beautiful home, Richella! 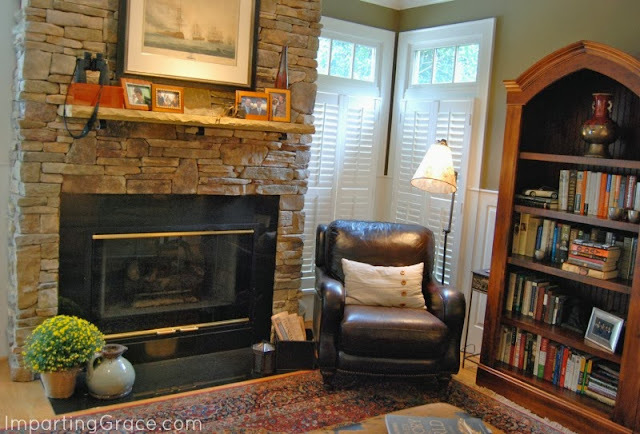 I truly adore how you decorate -- making things warm and inviting. I'm so glad you shared the floor plan -- I always wonder about the flow of someone's home, too. That's not too snoopy is it? I'm with you about the orange and turquoise. I've fallen hard for turquoise and consider it a "new neutral." Really, is there any color that doesn't look good with it? Anyway, thank you so much for the lovely tour! Your home looks beautiful. I might stop by for a cup of hot cider. Hello Richella, I think your home is very beautiful and looks so happy. I vote for your home! Life is amazing in how a house can just be a house, but your's is a home because your a person with heart! I look forward to reading your post for Oct. I love the fall touches and your house is just beautiful. I was holding onto summer as long as I could and now it is time for me to start some fall decorating. Thanks for the tour! Beautiful! Your home is spectacular. Thanks for sharing your floorplan...I, too, like to get the feel of how spaces flow. Often I will try to draw out a plan when reading a blog...with hilarious results...so i love to see the real thing! Hi Richella, I enjoyed taking your tour and your home is lovely. 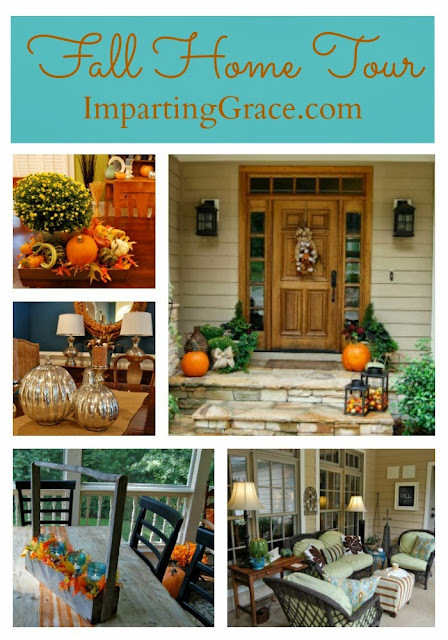 That interior and door decorations are fabulous and is such an easy, doable project. 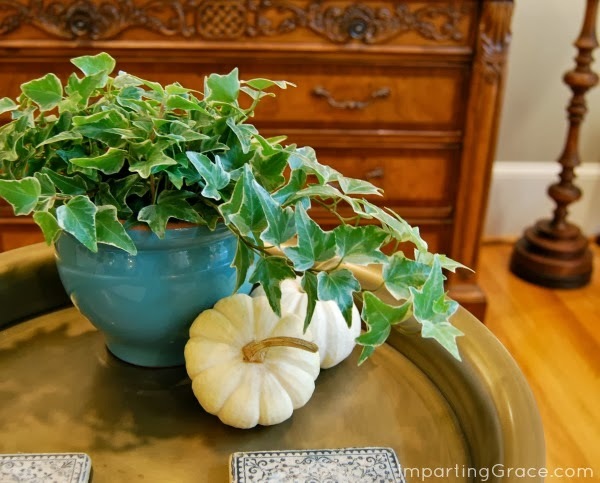 Love your use of metallic pumpkins in your home along with that wonderful! Thanks for sharing your beautiful fall tour with us! Just too adorable home! !